For girls of a certain age, those little multiple choice quizzes in the back of teen mags like Seventeen are the gospel truth. Circling A, B, or C correctly on a single question can mean the difference between a future filled with hunks and a future filled with lunks. Love Quiz!, developed by Alpha Studios, captures the feeling of those magazine love quizzes, but with a twist: You and your (presumably) male partner fill it out at the same time. You are both presented with the same question, and pass the phone back and forth to complete it. For every question that you and your partner answer identically, you get a point (represented by a shiny red heart.) Selecting differing answers from the multiple choice offerings means no heart, and no point. Those hearts at the end of each quiz are gathered up and used to fill your love meter, with the best possible score being 70/70. You can then share your score via Facebook or email. 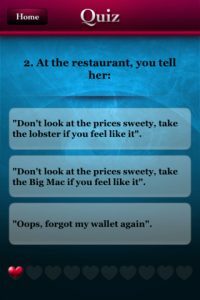 The quizzes offered by Love Quiz! are obviously a bit simplistic, and leaves little room for those happy couples out there who are good together because they are complementary and not identical. But then again, this is an app that provides quizzes for entertainment, so it’s best not to take it too seriously. Love Quiz! has a cute, if obvious pink-blue color scheme, and plenty of cute quizzes to try out. 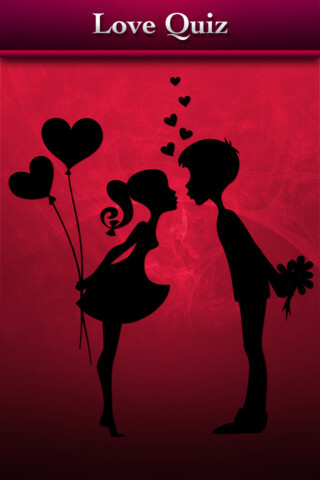 The latest version of Love Quiz! is version 1.3, released on July 17th. This version’s updates include 2 new quizzes (a total of three free quizzes now), added menu functionality, and the ability to rock out to your favorite music while you do the quiz. If you’re young, in love, and bored out of your mind, why not try out this free app and kill some time? 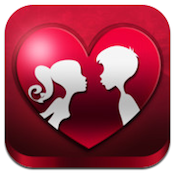 Love Quiz!is compatible with iPhone, iPod touch, and iPad. Requires iOS 4.2 or later.